katiemaytoo quilts: time to vote! 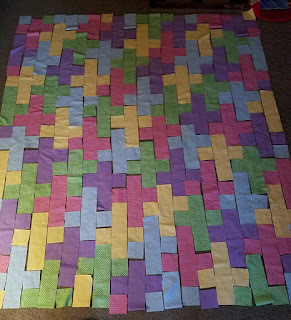 A few days ago, I posted my final project and the journey to make it for Project Quilting Season 10, Project 1. The voting is open through Friday, so if you have some time to check out some amazing projects, head on over and check them out and vote for your favorites! You get 10 votes, so if you'd like to use one for me, that would be great. But there are some pretty awesome quilts...I had a hard time picking my other nine! And while I'm waiting for the votes to be cast and the results to be announced (and the next project theme to be given), I started working on the graduation quilt for my niece. 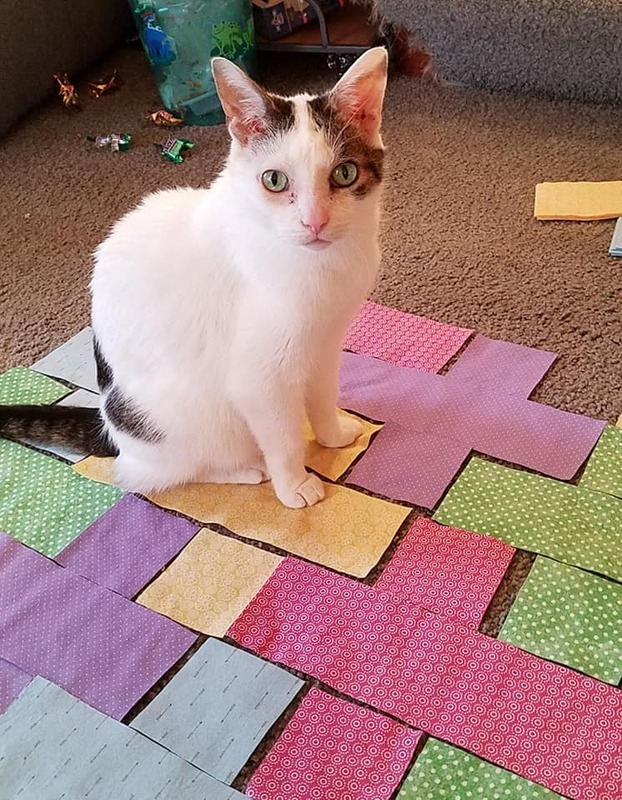 I cut all the pieces before retreat, but decided it was not the right time to start the quilt there. And boy am I glad I did! ...this took more than an hour. I had to get about six or seven columns on the floor before I could wing it without constantly consulting my diagram. Which didn't help much because I'd colored it with only four colors, but purchased six and decided to use five. Ugh! But I persevered and, with lots of comments from the peanut gallery (aka the hubby - sitting in the recliner just beyond the photos - you can see the candy wrappers he threw on the floor next to his chair behind Emma...boys...), I had a layout that looked pretty balanced. You can see the colors changing with the waning sunlight between the photos. We did have a beautiful sunny day yesterday (though fairly cold - not normal January cold, but cold enough! ), but being winter, those sunlight hours go fast. It took nearly as long to pick up as it did to lay out, but that was a must last night. There was no chance this would look anything like what I started with if I left it out overnight! 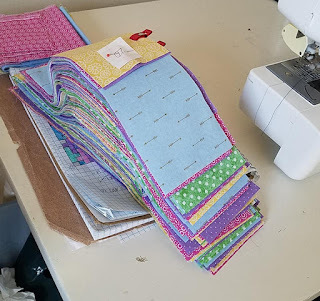 The pieces are all neatly stacked and ready to sew. Because the way this quilt is, I will be sewing vertical columns, not horizontal rows. I may have a little mental challenge there to start, but I think it will be okay. And I was happy I had enough of everything. I started to worry about 3/4 of the way through, but I ended up with at least one extra long strip and one extra square of every fabric! Thank goodness, since I had cut up literally every bit of fabric to get the estimated number of pieces I needed. Now that lunch is done, I should go sew. But first, Emma wants to know why I'm so interested in taking her photo here. Well, I had leftover spaghetti for lunch. I should have known that eating without Emma trying to share my plate meant something was amiss. 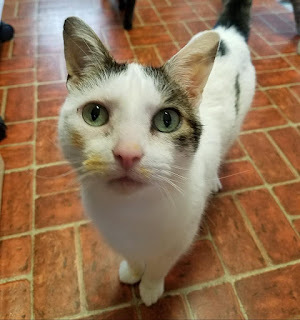 While I was eating, she was in the kitchen sink, licking out the bowl I heated the food in. Can you tell? Goodness! That's a lot of little pieces stacked up to sew together! Hope the cats don't decide to play with them! 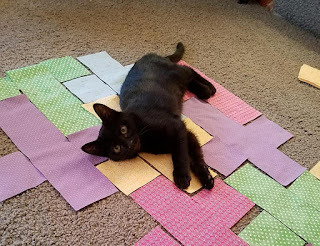 I do like the layout you had, and it will be a really nice quilt when finished. Happy Sewing! ---"Love"
Yep! I voted :) Good luck :). Yeah, a mental vision of Emma in the kitchen sink is funny. Harvey said that Chewy sat on the bathroom sink (not unusual for him) but turned and discovered himself in the mirror - and continued admiring from several different poses. LOL... that graduation quilt looks interesting - I'll just sit back and enjoy watching your progress on it; don't think I want to try it - at least not right now. Katie, I couldn't se where or how to vote. Can you email me as I'd like to vote for your quilt. Emma's spaghetti face is so funny. Such a look of innocence. That's a beaut and colourful quilt you have there. Thanks to the kiity helpers of course!